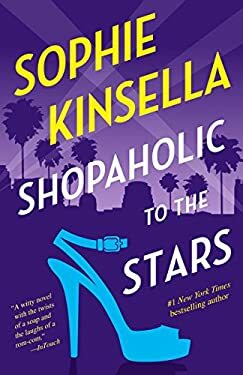 "NEW YORK TIMES "BESTSELLER Sophie Kinsella returns to her beloved Shopaholic series with Becky Brandon (nEe Bloomwood) newly arrived in Hollywood and starry-eyed. She and her two-year-old daughter, Minnie, have relocated to L.A. to join Becky's husband, Luke, who is there to handle PR for famous actress Sage Seymour. Becky can't wait to start living the A-list lifestyle, complete with celebrity sightings, yoga retreats, and shopping trips to Rodeo Drive. But she really hopes to become a personal stylist--Sage's personal stylist--if only Luke would set up an introduction. Then, unexpectedly, Becky is offered the chance to dress Sage's archrival, and though things become a bit more complicated, it's a dream come true Red carpet premieres, velvet ropes, paparazzi clamoring for attention--suddenly Becky has everything she's ever wanted. Or does she? Praise for "Shopaholic to the Stars"" " "A witty novel with the twists of a soap and the laughs of a rom-com." --"InTouch"" " "Shopaholic Becky is funnier than ever as she tries to make it in Hollywood as a celeb stylist." --"People"" " "Our beloved heroine Becky hilariously juggles motherhood and a new career. . . . Sophie Kinsella is such a genius." --"Redbook"" " "It's impossible not to fall in love with Becky and her antics, and this latest offering doesn't disappoint. With appeal for fans of Kinsella's prior Shopaholic books, this one will draw in new fans as well. Like the first six in the series, "Shopaholic to the Stars"] is screamingly funny and lots of fun." --"Publishers Weekly "(starred review) "Take the caustic wit of Gillian Flynn and the comedy of manners of Edith Wharton, add a British accent--that's Sophie Kinsella." --"The Globe and Mail" "Fans of the series who love Becky just as she is (and has always been) will enjoy this seventh series entry. . . . Kinsella expertly plots this story and deftly drops in some unexpected twists." --"Library Journal"" " "Becky is a truly engaging narrator. She may be self-centered, a shopping addict and a bit flighty, but she's also good-natured and genuinely funny. It's a joy to accompany her on her journey, no matter how tangled it seems at times. A light, enjoyable read that's pure escapism." --"Kirkus Reviews"" " "Winsome Becky's romp through Hollywood will thoroughly entertain readers, and the novel's conclusion neatly paves the way for Becky's next adventure." --"Booklist"" " "Loyal fans who have enjoyed Kinsella's flakey protagonist in previous stories will enjoy this outing." --Fredericksburg" Free Lance-Star"" " "Kinsella fans will be ecstatic for this long-awaited addition to the author's Shopaholic series. Lighthearted, warm, funny--Kinsella rules the red carpet with Becky's new Hollywood adventures. A little unsolved mystery at the end may cause the paparazzi to swarm Becky's home and leave readers wanting more." --"RT Book Reviews" "From the Hardcover edition."